يقوم برنامج FotoSketcher بتحويل صورك الشخصيه الي صور كرتونيه او صور مرسومه بقلم رصاص او كانها مرسومه بالوان ماء او مرسومه بالوان زيتيه . البرنامج ايضا يمكنك من عمل تعديلات وتحسينات علي الصور مثل زيادة الوضوح وتفتيح وتغميق الصورة والكثير من الاضافات الجميله . اكثر من 20 ستايل لتغيير الصور . البرنامج مجاني 100% وسهل الاستخدام , بقليل من الضغطات بالماوس تتمتع باجمل تاثيرات علي صورك . البرنامج يعمل مع جميع نسخ الويندوز Windows XP, Vista, 7 and 8 ولكنه لا يعمل مع نسخ الماك . 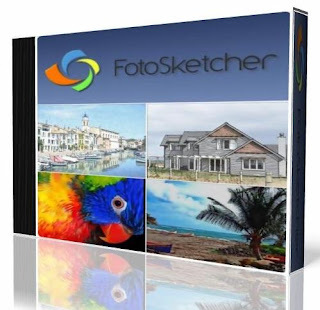 FotoSketcher is a freeware Windows software that allows you to transform your digital photos in wonderful cartoons, drawings or paintings. It has many features, others are constantly added to new versions. You can use over 20 different styles such as pencil sketches, watercolor, oil paintings and many others. If you need to improve your images use one of his easy tools (example: contrast, simplify image, increase luminosity, saturation of colors). You can also add simple frames and text to existing images. The program comes with Ask Toolbar when you choose the installer version but you can customize your installation and choose not to install the added toolbar or if you prefer try the portable version. It runs on most used Microsoft Windows versions such as XP, Vista and 7.